The problem of dowry in India is back in the spotlight after comedy group AIB's new video and a unique internet experiment by a matrimonial website. The popular comedy group is known for taking on social issues in its own funny style and their latest video - Honest Indian Weddings - appears to have done justice to its name. It shows the bride's family being under pressure to pay dowry to the groom's relatives. In the video, dowry is discussed between the families and the girl is left with very little choice but to marry the man. The video also makes fun of grand Indian weddings, where the guest list is often long and food is aplenty. The video, which has been viewed more than a million times, has received mixed reviews, with some finding it funny and others seeing it as against Indian traditions. Dowry is a centuries-old South Asian tradition in which the bride's family offers gifts, often in the form of cash, to the groom. India made the dowry system illegal in 1961 but it is still rampant in the country. Meanwhile, some websites exist in India that actually help you calculate your dowry. One website showed the following message in response to some random details I submitted. Most users took the quiz expecting to find their dowry amount, but they were surprised with the result - instead of the amount, the quiz gave the number of dowry deaths in India. "We wanted to get people's attention on this problem in a unique way and the calculator helped in achieving that goal," explains Aditya Save of shaadi.com. "Dowry is an evil practice, but has unfortunately gained social legitimacy in some parts of the country. So it gets very difficult to make people pay attention to a problem they are already aware of. But the calculator seems to have worked," he says. "Among the people who took the quiz, more than 85% were women and that just shows how concerned they are about this problem," he adds. The initiative has been praised on Twitter. Mr Save denies allegations that the initiative is a "clever marketing initiative". 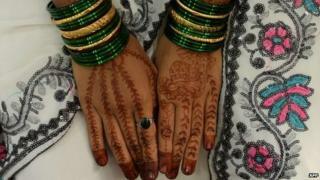 "We are in the business of wedding but are totally against the system of dowry. We want our subscribers to highlight cases of dowry demands, so we can take action and ban such people," he says.